One of the things that’s happened that makes the whole concept of ‘Britain’ untenable is that it’s been sold. Sold off and sold out. 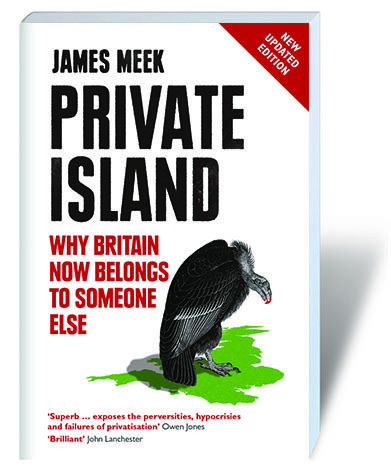 So congratulations to James Meek who has won the Orwell prize for books for Private Island: Why Britain Now Belongs to Someone Else who has articulated and documented this process beautifully. Judges praised his “careful and elegant exploration of what exactly privatisation has produced in our country.” As the author himself writes: “The essential public good that Margaret Thatcher, Tony Blair and now Cameron sell is not power stations, or trains, or hospitals. It’s the public itself. It’s us.” That sense of collective loss and the loss of the collective is rarely focused on. Instead we delve into the detail of policy consequence. It’s worth reflecting on this as the empty retread Tories wheel out the sale of council houses as a policy solution. “When Thatcher’s Conservatives came to power in Britain in 1979, much of the economy, and almost all its infrastructure, was in state hands. Exactly what gloss you put on “in state hands” depends on your political point of view. For traditional socialists, it meant “the people’s hands”. For traditional Tories, it meant “in British hands”. For Thatcher and her allies, it meant “in the hands of meddling bureaucrats and selfish, greedy trade unionists”. How much of the economy? A third of all homes were rented from the state. The health service, most schools, the armed forces, prisons, roads, bridges and streets, water, sewers, the National Grid, power stations, the phone and postal system, gas supply, coal mines, the railways, refuse collection, the airports, many of the ports, local and long-distance buses, freight lorries, nuclear-fuel reprocessing, air traffic control, much of the car-, ship- and aircraft-building industries, most of the steel factories, British Airways, oil companies, Cable & Wireless, the aircraft engine makers Rolls-Royce, the arms makers Royal Ordnance, the ferry company Sealink, the Trustee Savings Bank, Girobank, technology companies Ferranti and Inmos, medical technology firm Amersham International and many others. In the past 35 years, this commonly owned economy, this people’s portion of the island, has to a greater or lesser degree become private. Millions of council houses have been sold to their owners or to housing associations. Most roads and streets are still under public control, but privatisation has reached deep into the NHS, state schools, the prison service and the military. The remainder was privatised by Thatcher and her successors. By the time she left office, she boasted, 60% of the old state industries had private owners – and that was before the railways and electricity system went under the hammer. The original background to Thatcher’s privatisation revolution was stagflation, a sense of national failure, and a widespread feeling, spreading even to some regular Labour voters, that the unions had become too powerful, and were holding the country back. Labour, and Thatcher’s centrist predecessors among the Conservatives, had tried to control inflation administratively, through various deals with unions and employers to hold down wages and prices; Labour had, under pressure from the IMF, cut spending. But Thatcher and her inner circle planned to go further, horrifying moderates in their party with the radicalism of their intentions. The Trade Unions strength was overstated to justify Hatchet sorry Thatcher’s agenda. Now the pendelum has swung to two steps from Fascism. It is time to take it back , by whatever means are required. And I mean whatever, no matter the consequences. You’re quite right, James. I was a humble spear carrier in the humble army of civil servants in the old days and I well remember the ‘Dunkirk’ style fighting retreat we were forced to carry out over many years against the invidious tide of Thatcherism. Sadly we were stabbed in the back by our own bosses and unions and ended up loosing just about everything we had achieved. When I look around these days at the the sad state of many ordinary people I despair, but the pendulum will swing the other way eventually, and the sooner the better. Cameron only has a very slim majority and has many enemies at his back, even amongst his own so-called supporters. As regards this excellent article, I would re-nationalise the lot with no compensation. As my dad used to say, we will be just like America, a smaller version. I hope mrs t rots in hell.